The Daisy Spill Vase has been exquisitely designed and handcrafted in Ireland. 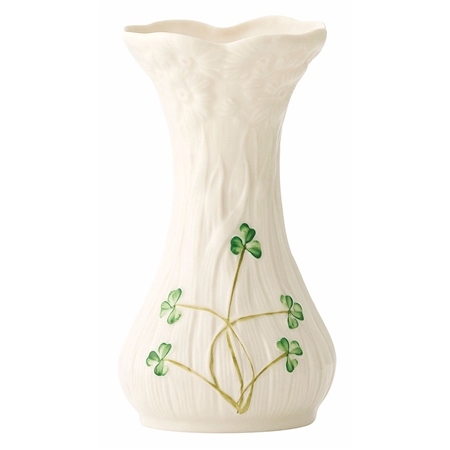 The delicate piece features an embossed Daisy design and hand painted shamrocks. Resident Belleek Designer Frederick Slater designed the Daisy Vase in the 1890's. One day as he looked out the window of the Pottery, which overlooks the River Erne, he saw a little girl picking Daisies. He sketched her and he noted the way she clutched the Daisies, the shape of which became the design of the vase. Many years later the popularity of this vase led Belleek to expand the range, making up the present day Daisy Collection. Love the beautiful design of this vase. I purchased 2 of these dainty vases for my guest bath. They are a perfect size for freshly cut small flowers-- especially clover. The China is so fine that light shines through when the vase is held up to the window.